At the end of each production cycle, the diamonds produced at our mines are delivered to our sorting facility, where they are cleaned and acidized, before being sorted into international sales assortments. The rough diamonds are first sorted by size (carat weight) and then each size faction is sorted into quality ranges, depending on each stone’s colour and clarity. High quality larger stones or coloured stones are sold as single lots. Individual mine production is kept separate, providing buyers with an additional level of knowledge about the goods they are purchasing based upon each mine’s unique diamond characteristics. Tenders last between four to six working days, during which participants view the assortments and place a confidential electronic bid on the parcel of their choice. At the end of the tender, the highest bidder wins the parcel. The production profile (diamond quality and size ranges) of a kimberlite remains highly constant over time, resulting in accuracy for diamond price forecasting. Our mines produce the full spectrum of diamonds, from low to the very highest quality and across a number of colours, including blue, pink, yellow and champagne. The image below shows a typical sales layout for one of our mines. In FY 2017, will Petra hold seven tenders per annum: three in the first half of the financial year and four in the second half as per the typical sales cycle schematic below. 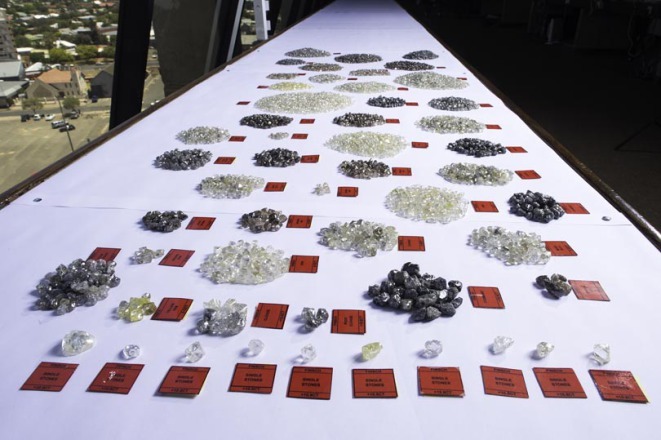 Petra times its tenders to ensure maximum participation from its international client base, thereby taking into account various secular and religious holiday periods which are likely to be quieter times for the rough diamond market.